Applications, like all man-made creations, fail; it’s just a fact of life in the information technology world. The goal of the IT department is to mitigate the risk of downtime and prepare for recoverability of critical applications in an efficient manner. Vision Solutions provides market-leading solutions for data protection and recoverability. 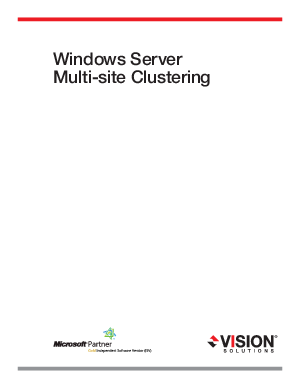 The GeoCluster feature, part of Double-Take® Availability, was created specifically to protect, extend and build upon the capabilities of Failover Clustering by providing redundant storage that eliminates the single point of failure inherent in traditional clusters as well as providing off-site cluster failover capabilities. Download this whitepaper to explore how the GeoCluster feature can benefit youre business.